In her part-memoir, part-historical text Lose Your Mother: A Journey Along the Atlantic Slave Route, Saidiya Hartman travels to Ghana, following the slave trade from Africa’s coast. Drawn to the collective history of the transatlantic slave trade to fill in the gaps contained in her own familial genealogy, Hartman richly weaves the narrative of her own personal search for kinship across time and the often untold and silenced legacies of slavery. Discussing this impetus to connect to the lost stories of those sold into slavery, Hartman writes, “This is the intimacy of our age with theirs–an unfinished struggle. To what end does one conjure the ghost of slavery, if not to incite the hopes of transforming the present?” (170). Mirroring Hartman’s invocation of the ghosts of slavery to transform the present, Cy Gavin’s current exhibition At Heaven’s Command at Sargent’s Daughters enacts a similar personal and political pilgrimage. Rather than Ghana, Gavin’s vibrantly beautiful yet historically rich exhibition renders the results of tracing his own personal lineage to Bermuda. Like Hartman’s drive to seek out collective accounts of the Atlantic slave trade in Ghana to bolster her own missing familial archives, Gavin’s current exhibition follows his last show Overture, which employed West African and other aesthetic allusions to speak to his own experiences with his father and family. His second exhibition with Sargent’s Daughters, At Heaven’s Command continues Gavin’s engagement with collective histories, finding unseen, underappreciated and overlooked connections in moments of resistance in Bermuda’s colonialist past. At Heaven’s Command represents the culmination of Gavin’s research-oriented travels through Bermuda, where his father was born. Gavin lived outdoors–sometimes in caves–while investigating the lush flora and fauna native to the island. In Gavin’s brilliant paintings, his intricate explorations of Bermuda’s vegetation are unmistakable as he converts the tropical landscape into a near mythical and magical environment through bright shocks of color. Not only examining the landscape of Bermuda, Gavin also mines its history of colonialism and slavery. A longtime English colony, Bermuda played a role as an essential way-station in the slave trade, bringing slaves from Africa to the West. The exhibition’s title even hints at this colonialist and captive history, taking a phrase from the patriotic song “Rule, Britannia!” Although the song is still sung today–let’s be honest, probably in pubs during football matches, a close read of the lyrics reveals a chilling reference to “Britons will never be slaves.” Well, except the actual slaves I guess. Unearthing Bermuda’s past, Gavin’s paintings showcase the thin line between this past and present, as well as the inability to completely ignore its resulting racial politics despite efforts to bury them–sometimes literally–under the luxury tourism trade. For example, Gavin’s painting Rosewood Tucker’s Point Golf Club and Cemetery features a ghostly black figure to the side of an opulent luxury resort. Rosewood Tucker’s Point Gold Club and Cemetery refers to the Tucker’s Point golf course, which in 2012 was built over the Marsden Methodist Memorial Cemetery. The Marsden Methodist Memorial Cemetery primarily housed the graves of black residents who lived at Tucker’s Town, a post-Emancipation neighborhood in the early 19th century that also experienced displacement in 1920 when the residents had to relocate for a hotel. In Rosewood Tucker’s Point Golf Club and Cemetery, Gavin deftly highlights that though these people’s graves and bodies may be covered, their ghosts will never be. Returning the bodies of these black residents to the tourist-friendly contemporary Bermuda through both the depiction of the body, as well as employing blood as a material, these histories in Gavin’s hands become etched on the landscape, unable to be forgotten. Not only engaging with the post-Emancipation histories of Bermuda, Gavin’s paintings also deeply explore slavery in Bermuda. In Hartman’s Lose Your Mother, she explains the continual significance of revisiting and reinterpreting the histories of slavery today. She writes, “If slavery persists as an issue in the political life of black America, it is not because of an antiquarian obsession with bygone days or the burden of a too-long memory but because black lives are still imperiled and devalued by a racial calculus and political arithmetic that were entrenched centuries ago. This is the afterlife of slavery–skewed life chances, limited access to health and education, premature death, incarceration and impoverishment. I, too, am the afterlife of slavery” (6). Gavin’s paintings, too, reflect that afterlife. In Sally Bassett, Laughing, Gavin revives the radical vitality of Sally Bassett, a slave who was burned at the stake in 1730 after being accused of attempted poisoning. Consistently maintaining her innocence before her death, Bassett claimed a sign would prove her guiltless. True to her proclamation, the Bermudiana iris grew from Bassett’s ashes after her death and still blooms on the island today. Continuing his use of unexpected materials, Gavin’s Sally Bassett, Laughing features seeds from the iris, tying the natural physicality of Bermuda’s landscape to Bassett’s story. An almost mystical figure in the painting, Bassett laughs through the vast landscape–an assertion of her continued source of resistance and rebellion in the face of white supremacy even in death. Further portraying a kinship beyond time between historical figures and his own experiences in Bermuda, Gavin’s Jeffrey’s Cave depicts an unmistakable merging between the past and the present. Representing a limestone cave that Gavin slept in during his stay in Bermuda, the cave also was known to house a runaway slave named Jeffrey. Painted in brilliant purple and with a hidden figure in the shadows who could be a representation of either Jeffrey or Gavin himself, Jeffrey’s Cave constructs a bond between Gavin and Jeffrey centuries apart. Discussing the importance of kinship as developed by the traumas of the transatlantic slave trade, Hartman observes, “For Europeans, race established a hierarchy of human life, determined which persons were expendable, and selected the bodies that could be transformed into commodities. For those chained in the lower decks of a slave ship, race was both a death sentence and the language of solidarity. The vision of an African continental family or a sable race standing shoulder to shoulder was born by captives, exiles, and orphans and in the aftermath of the Atlantic slave trade. Racial solidarity was expressed in the language of kinship because it both evidenced the wound and attempted to heal it. The slave and ex-slave wanted what had been severed: kin” (6). For many who are a part of the diaspora like Hartman and Gavin, this search for a kinship beyond time and physical archives–since so many records don’t exist–becomes a search for a place of return and belonging whether Ghana for Hartman or Bermuda for Gavin. However, both recognize the traumatic impossibility of return. In his corresponding video Now O Now I Needs Must Part, Gavin sings a traditional Elizabethan song, written by 16th/17th century composer John Dowland. 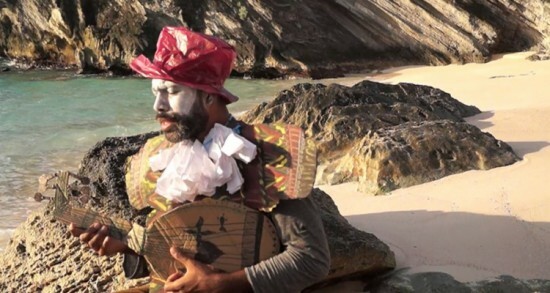 Dressed in Elizabethan attire, as well as pancake makeup, which recalls both Elizabethan bards and white-face, Gavin solitarily serenades Bermuda’s South Shore, looking toward Africa. With captions of the lyrics on the video, the song reads as a tribute to the countless individuals ripped from their country and sent into slavery. In addition to mourning the lives lost in the slave trade, Now O Now I Needs Must Part also subtly addresses the traumas of those who continue to live in the legacies of colonialism and slavery who cannot make that return. In Ann Cvetkovich’s An Archive of Feelings, Cvetkovich analyzes the trauma of transnationalism and the diaspora. Focusing on a film Brincando El Charco: Portrait of A Puerto Rican, Cvetkovich quotes the protagonist Claudia who says, “Even when nostalgia looks like a two-minute commercial to attract tourism, there must be a way I can regain this unspeakable part of myself. Even when there’s no return, even when I will remain a partial stranger anywhere and everywhere, how can I go back?” (130). Cvetkovich continues, “Her comment indicates that trauma accompanies, not just the rupture of departure and exile but the rupture of return. If the nation is diasporic and transnational, return can never be a simple reunification, and the histories, both collective and personal, that are conjured by return may remain ‘unspeakable,’ as trauma so frequently is” (130). Translating this unspeakability into his artwork, Gavin’s paintings and video in At Heaven’s Command provide at least some form of connection between the personal and the collective and the past and the present of Bermuda. If even for a quick moment within the brushstrokes of a painting, Gavin constructs an amorphous middle ground where these histories and narratives can coexist. As Hartman writes in Lose Your Mother, “It was a dream of an elsewhere, with all its promises and dangers, where the stateless might, at last, thrive” (234). Tags: African diaspora, An Archive of Feelings, Ann Cvetkovich, At Heaven's Command, Bermuda, Cy Gavin, diaspora, Lose Your Mother, Saidiya Hartman, Sally Bassett, Sargent's Daughters, transatlantic slave trade. Bookmark the permalink. excellent post. keep up the great work!